Meridian Ultra DAC is yours for £15,000 | What Hi-Fi? High-end British hi-fi brand Meridian doesn't do things by halves. Its latest release is a flagship, state-of-the-art digital-to-analogue converter. We are used to 'statement' products from Meridian, and its latest doesn't disappoint. 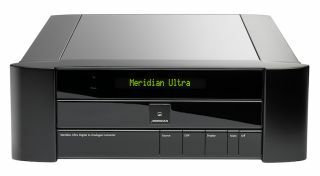 The result of nearly two decades of research and engineering, the Meridian Ultra could be the daddy of all DACs, according to Meridian's chief technical officer, Richard Hollinshead. The Ultra is the first DAC to include MQA's Hierarchical Converter Technology, which uses "multiple converters to increase temporal resolution while reducing noise and quantization errors". The rest of the spec sheet is equally impressive: there are dual mono DAC cards, DSP (Digital Signal Processing) filter options, upsampling and apodizing, says Hollinshead. Connections include USB 2.0, coaxial and optical digital, 75ohm BNC and AES3 on XLR, as well as Meridian's Speakerlink and compatibility with its Sooloos music management system. It can handle virtually any format up to 24-bit/384kHz including DXD, DSD64, DSD 128 and MQA (Master Quality Authenticated). The Ultra DAC is the first Meridian product to offer the choice of three upsampling filters when handling sources with a sample rate of 44.1kHz or 48kHz, such as CD or DAT (Digital Audio Tape). Additional features include LipSync, PC set-up and RS232 control through third-party systems such as Crestron. A fully linear power supply provides isolation from the AC supply, and even the front panel was designed for quiet operation, with a non-ferrous construction and a static LCD display chosen for its low electrical noise. Not surprisingly, the Meridian Ultra DAC doesn't come cheap. It is available in the UK in gloss black for £15,000, with bespoke colours costing an additional £500. MORE: MQA - What Is it? And how can you get it?